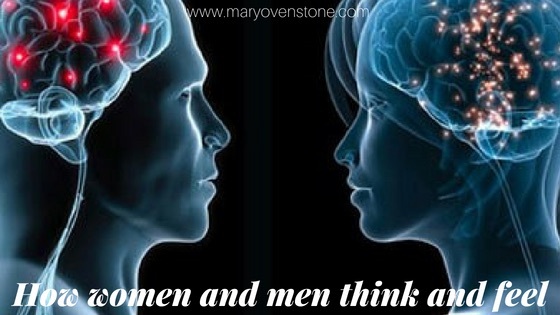 Only in the last five years Magnetic Resonance Images (MRIs) have isolated the differences between the way male and female brains actually work. You’d be surprised how different we actually are. Neuroscience can finally put paid to some of our myths about each other, and we can finally usher in a stage of new learning about how to better communicate and work with each other. One of the first myths is that men are left-brained and women are right-brained. While men do have a left-brained bias, women have a larger corpus collosum (the web of nerves that connect the two hemispheres of the brain) and many thousands more neurons that connect all the parts of the highly complex female brain, making the average woman truly both-brained. And a female has 6-7 centres for speech throughout the brain, whereas men have 1 or 2 only in the left hemisphere. What this means is that women can process thoughts and feelings all at once and can use words to both track the process and describe it. That should come as no surprise to their partners or male work colleagues who find it difficult to listen to women talk through their processes! The second, and related, myth is that men are the thinkers and women are the feelers. The fact is that men feel a lot, but just don’t always have words to describe their feelings and take longer to truly process an emotional issue. Women on the other hand initially bundle their feelings, thoughts and words, and need more time to separate them out, formulate comprehensive ideas and communicate them logically. While the male brain looks for expedient and strategic deductions, the female brain includes greater detail, more depth and breadth to her conclusions. Both perspectives are necessary to any complex decision-making process, both at home and at work. No wonder we were designed to fit together!